There is nothing as disappointing as having an antiperspirant finish when you need it most. Sweat happens. Some women have lost the sweat and odor battle due to using less effective antiperspirants bought from local drug stores. On opposite ends of the divide, Chic women do not mistreat their underarms! They always have natural deodorants that keep you naturally fresh for whatever sweat odor lies ahead. Let us delve into the top women’s antiperspirants and deodorants. We have come up with a handful, which gives you a variety of options when you do not like one. This will rule out the possibility of choosing a male antiperspirant over female antiperspirant. The hassle of searching for the most effective antiperspirant is like the proverbial needle in a haystack. Hence, we have taken the time to compile a list of all the antiperspirant that helps you during the stressful workout days or office days. 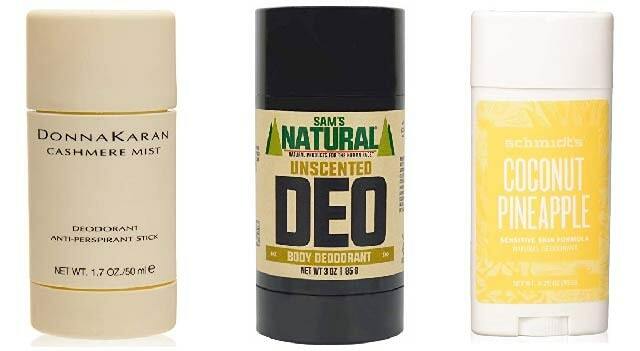 Whether you are into tote bags, purse, gym bags or suitcases, these deodorants will keep you smelling fresh all day. The list comprises of antiperspirants with a quick and easy application with lengthy last time. Dove Advanced Care Antiperspirant Deodorant gives you all-day freshness. With the added moisturizer, this deodorant does not cause unsightly underarm irritation. Most women have a whole beauty regimen. Women know what works best for their skin– day or night moisturizer; Skin cleanser; Minimalistic or no make-up. Women may seem to have an answer for everything skin, but somehow have overlooked armpits care. W orry not, though – Dove Antiperspirant is an absolute hack for those who want our skin to feel as healthy as it looks. The Dove Antiperspirant contains a lot of moisturizing elements. This product can help your skin recover from the irritation that regular shaving can cause. Dove leaves you with a beautifully soft and smooth underarm skin. It’s Mostly recommended for active women since it provides up to 48 hours of antiperspirant protection. Dove has balanced the quality and consistency. The delicate flowery scent can stay all day. Run-of-the-mill antiperspirant just doesn’t cut for most women who sweat excessively than others. Dri’s antiperspirants are as powerful as most doctors’ prescription. It’s been declared safe, so you’ll feel totally comfortable using it regularly. Whereas other antiperspirants have higher aluminum concentration–they are not as efficient as the Dri antiperspirant. The Dri Prescription antiperspirant contains 12% Aluminium Chloride and is the most powerful antiperspirant on the market you can buy without a prescription. As mentioned earlier, Aluminium Chloride is the most sought-after active ingredient in antiperspirants. Therefore, this antiperspirant is the strongest and most effective as it stands out from the rest. It contains the gem active ingredient as many prescription formulas. Doctors worldwide approve Aluminium Chloride as the active ingredient in combat excessive sweating. This is precisely why Dri ranks as the best deodorant for women. If you have a sensitive skin or just do not want to stink, this is your antiperspirant all day. With eight scents to choose from, Secret Invisible Antiperspirant wins hearts due to its efficiency in the application and minimal residue. Secret Invisible Solid Antiperspirant Deodorant is an excellent option since the application process is smooth and effortless- it does not feel wet or watery. When it comes to residue content, Secret invisible leaves no clumps in your underarms. There are only minimal streaks on clothes. Secret Invisible is affordable, so it is not going to break your bank. You can use this strength antiperspirant at night. You can apply before bedtime. Doesn’t contain alcohol hence is a good option for women who find other antiperspirants too harsh for their skin. It actually reduces perspiration while you sleep. It offers protection against smell for up to 48 hours, even after a shower. If hot temperatures or intense physical activity causes profuse sweating, try Degree’s antiperspirant formula. If your daily routine also involves running late at times, then this antiperspirant gives you the confidence to work in a room while smelling fresh. It is unique and practical as it contains heat-resistant molecules help you stay dry when you need it most. There is no other antiperspirant that releases scent as you move, so you will stay smelling fresh all day. When you sweat, this solid’s moisture-activated capsules release the fragrance. If you sweat regularly, this option is something slightly stronger. It is a step up from standard over-the-counter antiperspirants. Has a higher amount of aluminum. This is a luxurious antiperspirant with a subtle scent. The long-lasting ability is a triumph for many women who love smelling awesomely fresh. The cashmere scent is heavenly and blends well with most perfumes. If you want to ooze confidence with your scent, this is the antiperspirant to buy. The cashmere mist is just as indulgent as it appears. It has a boisterous fragrance made of lily, vanilla, amber, and sandalwood. This is a loved antiperspirant because of its clean and simple active ingredients! Its award-winning formula provides scent-free deodorant protection. The coconut-pineapple scent is the most favorite among ladies- because it masks odor efficiently and keeps you dry. This product is for those who want to smell great and avoid irritation, its better a solution for stinking odors. Easily absorbed; the application requires only a small amount. Made from clean ingredients: It contains no aluminum. Smelling good, like you do right out of the shower has never been easier. If you are looking for a fragrance-free beauty routine, opt for this natural deodorant. The antiperspirant does not contain chemicals. Rather, it is a plant-based deodorant that offers long-lasting effectiveness and underarm freshness without irritating the skin. Sam’s intriguing scent is suitable for any adventure that comes your way. It is ideal for people looking to switch and walk tall with a natural deodorant that works. This deodorant goes all natural and raw by letting the aroma of all-natural ingredients stick out. With this antiperspirant, Sam’s keeps it real at night even after the sun goes down! It uses coconut oil and baking powder to block odor. This is another bestseller antiperspirant on Amazon, meaning most people find it very effective. With one wipe, you can stop sweat for up to a week (yes seven days!). Just rub a sweat block wipe your underarm and you will not sweat at all. This product reduces perspiration instantly and is very effective. Hint: Apply this product night. Then the next day after your shower, apply your normal perfume. The main cause of the body odor is the bacteria living in our skin especially around the armpits. These bacteria metabolize proteins and sugars in sweat and emit an odor as a byproduct. Consequently, the sweat does not actually smell it is the bacteria that cause body odor. Let us define antiperspirant and deodorants. Antiperspirant and deodorants handle sweat differently. Antiperspirants prevent sweating. According to FDA, most products sold as antiperspirants reduce sweating by at least 20 percent. Most antiperspirants contain aluminum, which creates a gelatin plug that clogs the sweat glands. Resultant clog causes little or no perspiration. However, when we do not sweat, bacteria have nothing to feast on. Thus we do not emit body odor. Deodorants do not contain aluminum and do not prevent perspiration. Distinctively, deodorants mask odors in a simple way. Most deodorants contain synthetic fragrances and essential oils that mask the body odor. Deodorants neutralize smell by relying on baking soda or modern-day antimicrobial C12-15 alkyl benzoate. Some products labeled as antiperspirants and deodorants rely on a combination of the two processes. Some people fear that aluminum-based deodorants can lead to absorption of aluminum metal in the blood. They also fear that the buildup has a potential to cause Alzheimer’s and cancer. However, FDA has declared all aluminum-based antiperspirants safe for use. The only difference between male and female antiperspirants is the scent. Though most campaign ads tend to imply that female and male sweats are different, research shows that that is not always the case. In fact, there is no difference between men and women’s products. A physically active woman releases more sweat than a man who has a desk job. In this case, the woman will need a stronger antiperspirant that the men. This still begs the question, do men and women need different deodorants. Not really, the ingredients in the different products are the same. The difference is really about personal preference of the scent and application style. 1. Are you dealing with sweat or odor? Okay. What exactly do you want to achieve? Stop sweaty underarms odor or both? Set this goal first. Many people will say “both”. Others just want to hide the embarrassing stains while others want to conceal the body odor. In this case, antiperspirant will cover sweat while deodorant will mask body odor. We recommend that you buy both the antiperspirant and deodorant to get the results you want. We all want to stay dry and smell fresh. Tip: Use antiperspirant at night for dry armpits and deodorants during the day. This will keep your underarms dry and smelling great all day. An Antiperspirant and the deodorant combo is not an effective match to using the two products separately. First off, all always study the ingredients to eliminate fake antiperspirants. This means uncovering if deodorants that merely mask the odor. Look for an antiperspirant that contains aluminum chloride, coconut, zinc oxide or baking soda. Though FDA has overruled the side effects of aluminum chloride, most people prefer natural antiperspirants. Through online platforms like Amazon, you can learn from the customer reviews on which products work and, which ones do not. Skim through the thousands of reviews and look for one with most positive reviews. Shy away from antiperspirant with fewer reviews or ratings. Always choose antiperspirants that have four or five-star ratings. Also, watch for product reviews from people who have used the product first hand. While at it, keep in mind that some products may not work for every skin. Regardless of the manufacturer information, you need to scrutinize the antiperspirant you want to buy. Check the FDA ratings and approvals of the product. In the same breath, it is important to find out if renowned professionals have independently tested the product. 5. Is it strong enough? People suffering from hyperhidrosis, (excessive sweating) need strong antiperspirants. Out-of-the-mill or traditional drug store antiperspirants just will not cut. Suffering from excessive sweating creates lots of embarrassing situation. Men and women with this condition sweat regardless of the physical activity. The sweating just occurs out of the blues without warning symptoms. Consequently, with this condition, people need to use strong antiperspirants. Most dermatologists recommend a blend of aluminum and zirconium. New antiperspirants are most effective because they contain both elements. Additionally, they are less irritating on the skin. Armpits areas have delicate skin thus, harsh irritants are a no-no. To get suitable antiperspirant for women with sensitive skin, choose products with no or less fragrance. C12-15 alkyl benzoate based antiperspirants are safe as it provides safe emollient and antimicrobial benefits. Deodorants that block odors contain at least the following components. Coconut oil: Coconut oil kills odor-causing bacteria. Primarily, it is the lauric acid that eliminates the bacteria. Baking soda: Baking soda kills the bacteria and body odor by increasing the acidity PH of the armpit. If you are constantly worrying about sweat stain, you may want to get prescription antiperspirant or clinical antiperspirant. How much a woman sweats depends on varied factors – age, weight, genes, gender, environment, and diet. Normally men sweat more than women do. However, women are not immune to sweating. Excessive sweating can occur when one’s body needs to regulate the temperature. Moreover, sweat happens in both male and females. Even if you do not suffer from hyperhidrosis, excessive sweating meddles with your life. The final FDA monograph on antiperspirants gives no rules on how to use the term “clinical strength”. This means it is unclear whether over-the-counter clinical strength antiperspirants are stronger and efficient than regular strength antiperspirants. We recommend that when choosing between these two types, start with “regular-strength” picks and only use clinical strength if the standard picks fail to impress.